Ronnie O’Sullivan continued the defence of his English Open title with a 4-1 third-round win over Matthew Stevens. The five-time world champion, who made a maximum 147 break in his second-round victory, was always in control against the former UK champion. 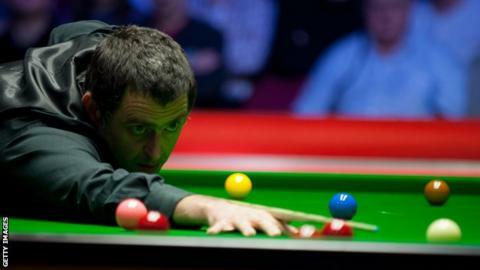 O’Sullivan will face Scotland’s world number 87 Eden Sharav in the last 16. Neil Robertson, Stuart Bingham and John Higgins also went through to round four but Anthony McGill was shocked 4-2 by 18-year-old Luo Honghao. O’Sullivan, 42, has enjoyed an eventful week in West Sussex, labelling the K2 Leisure Centre in Crawley a “hellhole” on Monday and then recording the 15th maximum of his career 48 hours later. He was quickly into his stride against Stevens, making a break of 75 in the opening frame, but the Welshman – who has only won one of their previous 10 ranking-event meetings – hit back with a 90. However, O’Sullivan got on top again, allowing Stevens just five points over the final three frames. The world number three plays 26-year-old Sharav in Thursday’s evening session. Elsewhere, Robertson overcame Alan McManus 4-1, Bingham edged out Thepchaiya Un-Nooh in a decider and Higgins beat Martin Gould 4-1, but Mark Selby’s conqueror Ben Woollaston was beaten 4-3 by Ricky Walden. World number eight Shaun Murphy is also out of the tournament, losing 4-1 to Robert Milkins.